The magic lantern was since its creation in the 17th century, the ruler of pre-cinema. It outlived by a few years the invention of cinema. This device was able to cast painted images on glass plates as well as (in the second part of 20th century) photographs. The illustration shows two parallel magic lanterns giving the eye-catching effect known as dissolving views (the retroprojection effect). 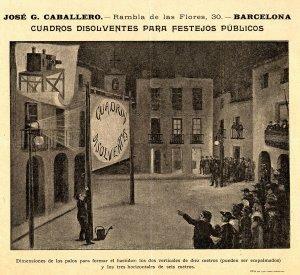 This illustration was attached to a letter dated from 24 May 1898 written by José G. Caballero in Barcelona to the Guadalajara city council to offer them the exposition of his collection of images during the traditional October party.We have more than 2,000 images with two, three or more light effects, that represent daily and nightly landscapes, portraits, deeds, indoor museums, sunrises and moonlight, train passages, steamboat shipwrecks, remarkable building ruins, volcano eruptions, fires, snowfalls and chomatropes.